Against The Wicked City: We dance for the spirits and yet they are not appeased. We dance for the spirits and yet they are not appeased. 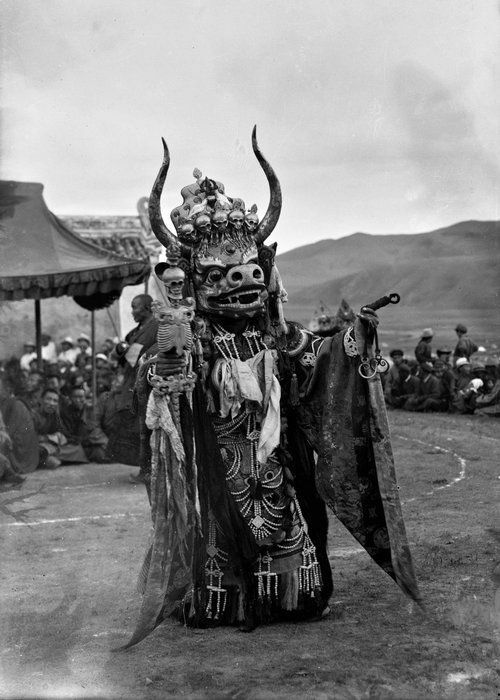 The Tsam or Cham ceremony is a ritual of Tibetan origin, in which masked performers enact symbolic dances in order to spiritually purify themselves and the surrounding environment. 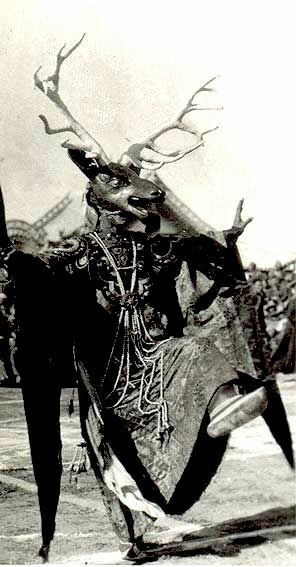 Like much of Tibetan Buddhism, it bears a strong resemblance to the indigenous shamanic traditions which were incorporated into local Buddhist practise: and it may have been this shamanic heritage which helped it to catch on in Mongolia, where Buddhist monks began performing Tsam dances of their own in the eighteenth century. 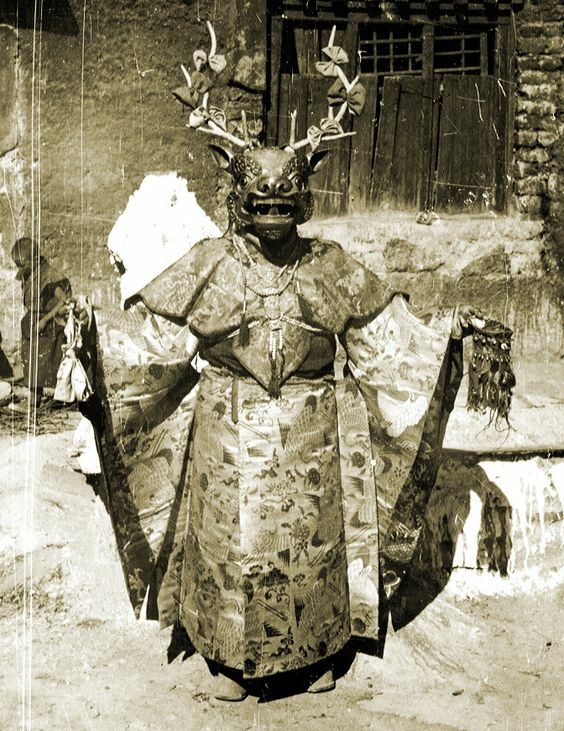 To a population familiar with Tegriist shamanism, with its use of ritual masks and dances, it probably seemed logical that Buddhist clergy might also achieve their spiritual objectives by putting on masks and dancing: and the Mongolian Tsam rituals quickly became even more elaborate than their Tibetan originals. The setting of ATWC is mostly pegged to the seventeenth century, which is before the flowering of Mongolian Tsam traditions: and in any case, I'm extremely wary of turning real religious ceremonies into gaming fodder. 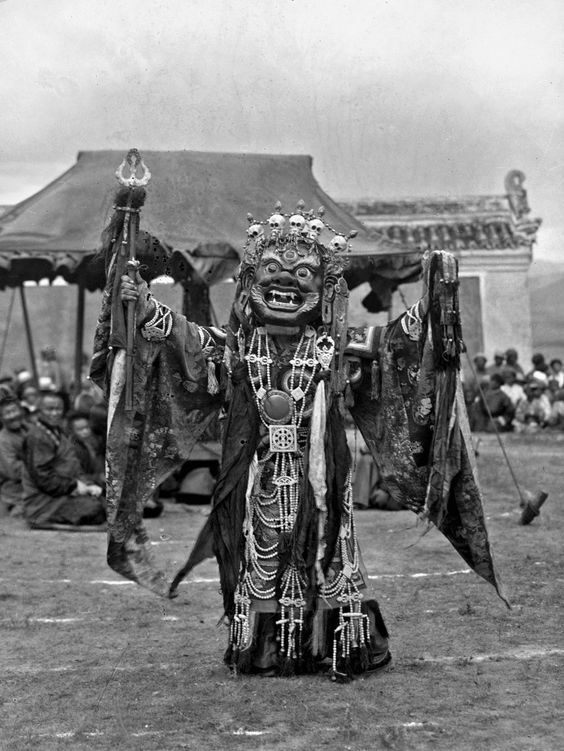 Still, I like the idea of the having something similar to the Tsam ritual - let's call it the Great Spirit Dance - as an exciting new ceremonial technique, knowledge of which is just starting to filter into the steppe khanates from some half-legendary mountain kingdom in the south. For the steppe peoples, the Great Spirit Dance is still something daring and experimental and dangerously foreign, which many people have heard of but which very few actually know how to carry out. As such, the performance of such dances is only likely to be attempted by the truly adventurous - or the truly desperate. Here's how it's supposed to work: through ritual supplications, powerful spirits are drawn down into the masks, which become their temporary homes. The ritualists then don the masks and perform their ceremonial dances, symbolically enacting the cosmic order of the universe. The spirits inhabiting the dancers are reminded of their place within the cosmic system, and at the end of the dance they depart from the bodies of the ritualists in a state of harmonious contentment, meaning that the chances of them deciding to unleash plagues and famines and other disasters upon the people will be drastically reduced in the year to come. They might still do those things, of course: but if they do, it's likely to be because they have a good reason for it, rather than just because they woke up feeling spiteful that day. Here's the harmless way to get it wrong: if you mess up the construction of the masks, or the initial ritual preparations, the spirits won't be called down into the performers. You can still do the dances, and if your human audience is paying attention to the symbolism they might even learn some useful religious lessons - but the spirits won't be influenced, because the spirits won't have turned up. As a result, they'll be no more or less likely to send a murrain on your cattle than they would be in any other year. Here's the really dangerous way to get it wrong: if you get the ritual masks and preparations right, but then mess up the dance, then the spirits will arrive... but they won't leave. You've called them here, into your masks and your bodies, and you're dancing for them... but the dance isn't telling them anything, or at least not anything that makes proper sense. They get confused. They get frustrated. They won't let you stop dancing. They won't let you take the mask off. They want you to do it right. Thus it sometimes happens that travellers on the steppe chance across a ragged band of dancers, arrayed in the tattered remains of once-fantastical costumes, leaping and stomping their way across the empty lands. 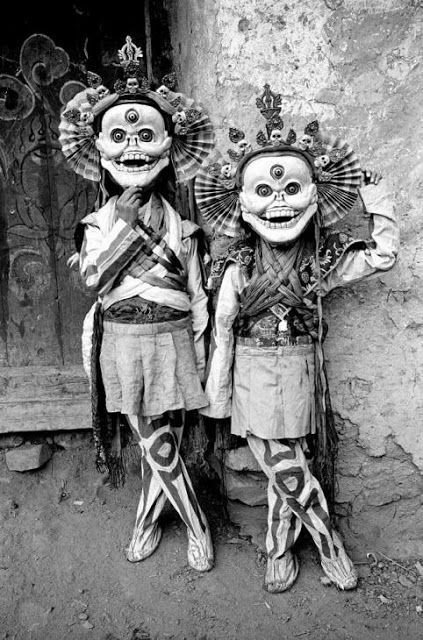 Their huge, heavy masks sway and nod to the beat of inaudible music, and through their open mouths can be glimpsed the wild eyes of the dancers, spirit-ridden, gleaming, and crazed. They move in great wheeling circles, their feet tracing intricate mandalas across the featureless grasslands of the steppe. They never eat. They never sleep. They never stop. The spirits want you to join the dance. They will each grab one dance-partner and whirl them away, carrying them off over the steppe for 2d20 hours before releasing them and pirouetting off. If resisted they will become forcible, first grabbing and grappling, then escalating to actual violence. They'll dance with unconscious bodies or lifeless corpses if they have to. The spirits want musical accompaniment. For 1d6 hours, they demand that you play for them, with whatever instruments you have available: if no-one has any musical instruments, then they'll accept beatboxing and drumming on nearby objects instead. They're not picky about performance quality, but will grow agitated and violent if you can't keep the beat. The spirits want new bodies: these ones are becoming quite worn out. They will try to grab victims and force their masks over their heads, using whatever degree of force is necessary to do so. Anyone who has such a spirit-mask forced over their head must pass a WILL save each round or suffer spirit possession. The mask's previous wearer will be freed from the spirit's influence once the new victim has been possessed, but they will be in a terrible physical condition, and will die in 1d6 hours unless they receive immediate care. The spirits want an audience. You have to sit and watch them for 2d12 hours, cheering and applauding whenever any of them does anything especially athletic: after this time is up, they bow and dance away. They will use force, and if necessary violence, to compel continued attention. The spirits have questions, and they want you to answer them. The imperfect symbolism of their dance has puzzled them rather than placated them, and now they surge towards you, roaring out theological queries like challenges: 'What is the nature of heaven? What is the purpose of suffering? Of what essence are the Men of Bone and Iron? What is the true homeland of the soul?' If your answers are good enough to give them something to think about, they'll whirl away and dance around contemplatively in a circle for a while, giving you a chance to leave. (For these purposes, clever-sounding wordplay is just as good as something genuinely profound.) If they receive obviously unsatisfactory answers, or no answers at all, they will become frustrated and attack. The spirits believe they are engaged in a ceremonial re-enactment of some primordial battle... and that you are the enemy. They attack furiously, yelling out the names of antique war-gods as battle-cries, and forcing their luckless hosts to fight until they have been hacked to twitching pieces. 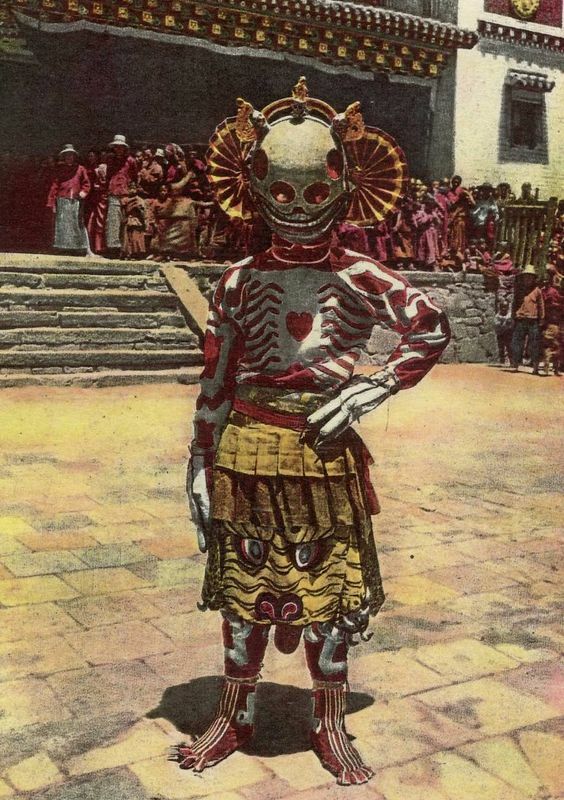 PCs confronted with such possessed individuals may try to free them by pulling their masks off, but these unfortunates are not so easily saved: while the spirit rides them, the mask is effectively their actual head, and cannot be removed by any means short of amputation. (The exception is if the spirits themselves will it - see 3, above.) Aside from killing them, there is only one way to end their possession, which is to identify what is wrong with their dance and then demonstrate to them how it should actually be completed: if this is accomplished, then the spirits will be satisfied and depart, and their hosts may yet be saved with the aid of prompt medical attention. (They will remember their possession only as a blurred and interminable dream.) 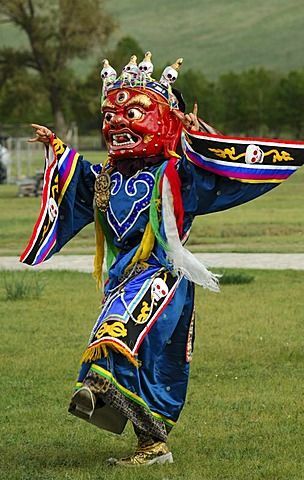 For anyone other than a Spirit Dance expert, understanding the flaw in the dance's symbolism requires a 1d6 x 10 minutes of close observation, a specialised religious education, and successful Intelligence check; demonstrating what the correct version should look like requires a great sense of rhythm, 3d6 minutes of dancing, and a successful Dexterity check. Both are likely to be challenging under combat conditions. Possessed Dancer: AC 15 (superhuman agility), 3 HD, AB +3, damage 1d4+3 (inhumanly strong kicks and punches) or grapple, FORT 8, REF 8, WILL 8, morale 12. Possessed dancers are immune to all mortal magic, as well as to fear, exhaustion, and pain. They can never stop dancing for any reason until they are either cut to pieces or freed from the spirits that drive them. It is always good to see more of your Central Asia setting ideas. For some reason this post really puts me in the mind of wanting to run a game with this setting. There are a lot of good ideas in this post. I think the first result for the disposition of the spirits could make a good start to a campaign: "You were traveling with a large caravan when crazy people in masks showed up and forced you to dance with them. You blacked out after a few hours and now you awake to find yourself in the middle of nowhere, surrounded by a bunch of strangers (other PCs)." Also I am curious: the possessed dancers are "immune to all mortal magic", but what does that apply to in the setting? It seems like only the Mindblades and the Order of the Diamond Mind have overtly magical powers. Do you have plans for a more conventional magical class sometime? Maybe also the abilities of Renunciates and the Word guys. The eternal damned dancing reminds me.of my favourite folk creature : the Jack Mistigri. Loving this blog, particularly the central asian stuff! I’m working on a Pacific Northwest setting that uses masks a lot and this is really inspiring, thank you!